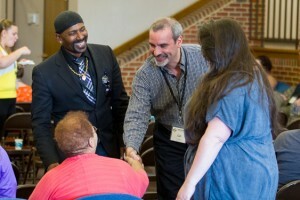 To the outsider, the June 15-18 Restorative Justice in Motion conference at Eastern Mennonite University may have looked like any other summer gathering of intellectuals, ready to share, network and learn. Yet to overhear bits of conversation was to immediately be confronted by the difficult and inherent tensions of restorative justice, which emphasizes repairing harms of all those involved. It’s best to describe those tensions in questions, notes conference organizer Carl Stauffer, co-director of the Zehr Institute of Restorative Justice: Is it a social movement that encourages whole-systems change or a solidifying field of practice? What does it mean if those facilitating the process operate from a place of white privilege? Where are its efficacious impacts: in creating restorative cities, in transitional justice processes within warring countries, in trauma healing, in prisons? Carl Stauffer, co-director of the Zehr Institute for Restorative Justice, greets participants. To the left is Raj Sethuraju, professor in the School of Law Enforcement and Criminal Justice at Metropolitan State University. “I think people were ready to converse in ways they hadn’t had the space to before,” said Soula Pefkaros, a doctoral student and 2010 graduate of the Center for Justice and Peacebuilding, who worked on the conference’s organization and format. 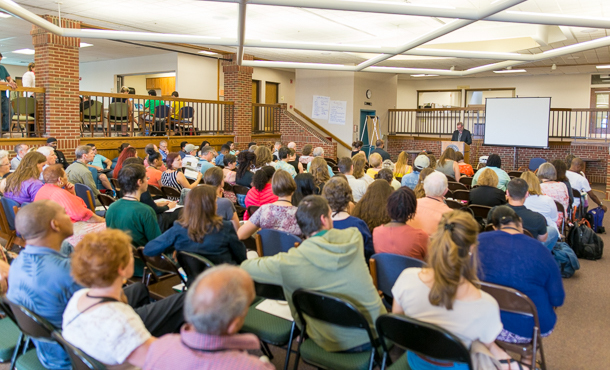 The conference is the second event within a larger three-year project to map the field of restorative justice. 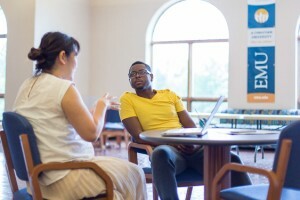 In summer 2015, 36 people representing a broad diversity of experiences, practices, backgrounds and identities, met for five days at EMU to discuss the future of the field. Renowned practitioners joined with an equal proportion bringing diverse and often-unheard perspectives. restorative city movements, represented by groups from Washington D.C., Harrisonburg and Whangai, New Zealand. Sessions were developed not only around settings where restorative justice principles can be practiced, but also around themes and challenges discussed in the consultation. Soula Pefkaros, conference facilitator and doctoral student, chats with fellow Center for Justice and Peacebuilding alumna Barb Toews, now teaching at University of Washington. Toews has worked in victim-offender reconciliation and with the Pennsylvania Prison Project and Inside Out Prison Exchange Program. Another emphasis was offering engagement opportunities across the learning modalities. Indeed the conference did just that, providing venues for “banker-style” seminars with linear seating arrangements and more organic explorations created by circles processes, storytelling sessions and experiential learning environments. By the end of Thursday’s scheduled sessions, a few “flare-ups” and “hot moments” had occurred. Conference organizers addressed concerns and grievances with the help of peacemaking circles expert Kay Pranis, a conference participant. She hosted a three-hour-plus circle late into the evening. Yet many participants left invigorated by the conversations and the shared vision of creating a more equitable society. “The conference rocked my world view, challenged me in very deep ways, and above all else gave me hope,” said Josh Bacon, associate dean of students and director of Student Accountability and Restorative Practices at James Madison University. “Connecting with peacebuilders from around the world who are open to challenging and learning from each other is energizing. This group is not afraid to address the serious, confrontational, and deep issues that affect our work. I think in this spirit we all know how important this works is and the gravity of the issues facing our world. Marqees Banks, of Los Angeles, was among a continent of youth participants. Banks has been a counselor at the Building Bridges summer program offered by the California Conference for Equality and Justice. At least one participant had made up his mind about the “RJ as social movement or social practice” question. Marqees “Sky” Banks learned about restorative justice after he had a fight with a fellow student a few years ago at Augustus F. Hawkins High School in South Los Angeles. That’s where Joseph Luciani, a EMU Center for Justice and Peacebuilding graduate, is restorative justice coordinator. Banks, who is contemplating University of Southern California, UC Berkeley and a few other options, has been a counselor at the Building Bridges summer camps sponsored by California Conference of Equality and Justice and he loves bringing people together to dialogue and bond and learn to respect each other.